This is a FREE service for those who "want" or are looking to "find" a certain item. If you have something to sell or trade....click the link below. Not responsible for any typographical errors. All information is copied and pasted from person listing the ad. WANTED: YOU....to be a Fan of Ventriloquist Central on Facebook! Interested in purchasing a Chance Wolf "Pocket Figure" featured at Vent Convention. Please send price/info to croftbuzz@gmail.com . Thanks! Hi, I am looking to repatriate an Insull dummy or just the head to here in UK just 10 miles from where he was created. I know I am flying a bit high here but if you can send me pictures, details and your price I will consider most things. Cash waiting. Wanted: Make a 9 year old buys dream come true! 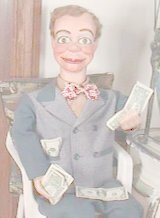 Ventriloquist Marketplace "Buy, Sell, Trade" page is only a listing service to allow anyone to offer, sell, buy, or trade ventriloquial items. We are not involved in the actual transaction between buyers and sellers. We have no control over and do not guarantee the quality, safety or legality of items listed, the truth or accuracy of listings, the ability of sellers to sell items, the ability of buyers to pay for items, or that a buyer or seller will actually complete a transaction.